MoreTricks.com is a growing technology blog which concentrates on “make money online, SEO, blogging, WordPress, blog, social media, web hosting, Search engine optimization, make money blogging, affiliate marketing, link building, Google+, Facebook, Twitter , and more …You can find more topics by surfing through MoreTricks.com. Your article will be published on the home page of MoreTricks.com for some days (Depends). Your posts will be shared with all the social media sites (currently joined) and with our beloved readers. The Guest authors or Writers who willing to write on MoreTricks.com should follow the below guidelines strictly.Any one violating the guidelines will be disqualified from Writing on this site and will be banned from MoreTricks.com without warning or notice. You are not allowed to add any type of affiliate links to your post. You are not allowed to link to your blog for self promotion.Since you are allowed to put links on your profile at the bottom of every post you make. Provide Relevant images and videos or flash into your posts and make your posts attractive (Size is limited). Copying others work will cause permanent banning from MoreTricks.com .I am respecting others work and this is strictly prohibited .In case you are used any of others ideas don’t forget to give credit for them. Comment is the back bone of blogging ,be interactive and try to answer the questions by the users. At last ,Your post should have a minimum of 300 words. How to Start Writing ? Before you proceed to Writing ,Make sure that you are read and understood the Guidelines for writing on MoreTricks.com. Go to Registration page and enter your User Name , Email id and register with our system. Your log in details will be mailed to your email address provided. Now Go to Profile page and log in with the details which are available in mail you recieved. 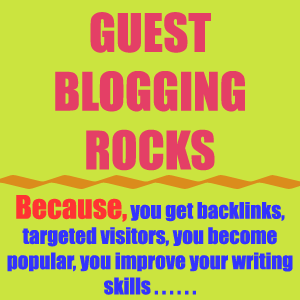 Update your profile to enjoy benefits of guest blogging. Submit article : Click here or Go to Posts ->Add New and write your post and click submit for review .Make sure that you are entered all the necessary details. I will review your post manually and publish it if your post satisfied all the above guidelines. For any assistance please contact me using any one of the below method.